There is so much going on here at Crystal & Co. I failed to post about my meal plan last week, but that did not mean I was not cooking. Everything is just kind of kicking my tail right now. Homeschooling, blogging, a sick little one, working on a ebook, teaching blogging classes, the free weekly hangout we present each week, kids sports, etc. I need a clone. I am sure at some point you have felt the same. I’ve been on the hunt for recipes using apple butter. I made a big batch of it and I am searching for yummy ways to use it up. I will be sharing the apple butter recipe with you this week. It’s yummy! Here is what we’re having for dinner. Crockpot Apple Butter Chicken– using my crockpot apple butter recipe that I will be sharing this week. Cabbage and Hamburger Casserole– trying a recipe from one of my grandmother’s old cookbooks. I will share this recipe soon as well. 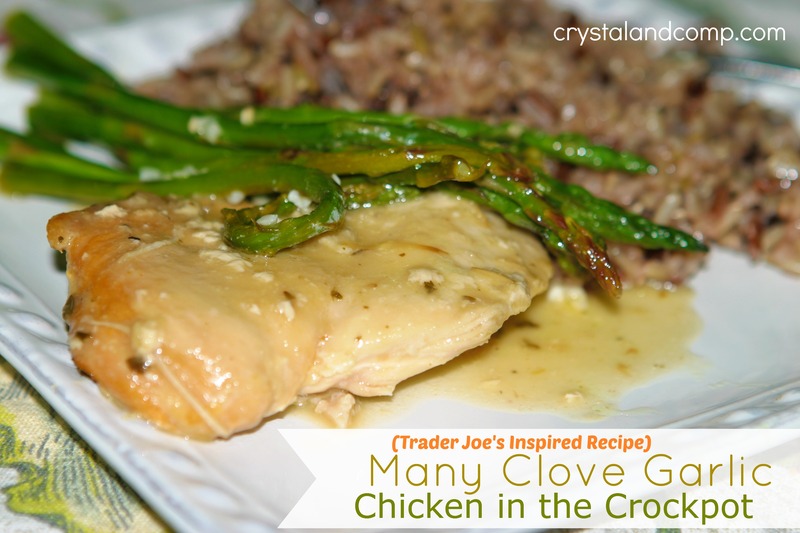 Many Clove Garlic Crockpot Chicken – served with rice. Puerto Rican Stew– I have potatoes I need to use up. Leftover Buffet– use ‘em up! Halloween Night we have a tradition to trick or treat with friends and then we all go out to eat together.